Requested from PCOO by Gregg Jones Galgo at 05:31 PM on Sep 29, 2018. 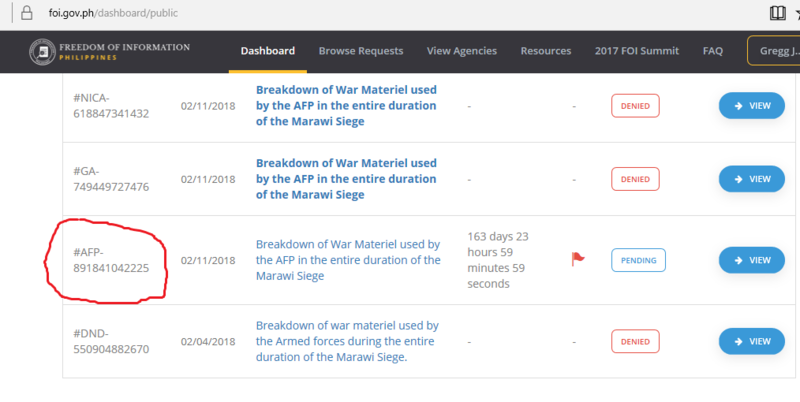 Purpose: For follow-up of pending requests and clarification why these agencies are not taking action. 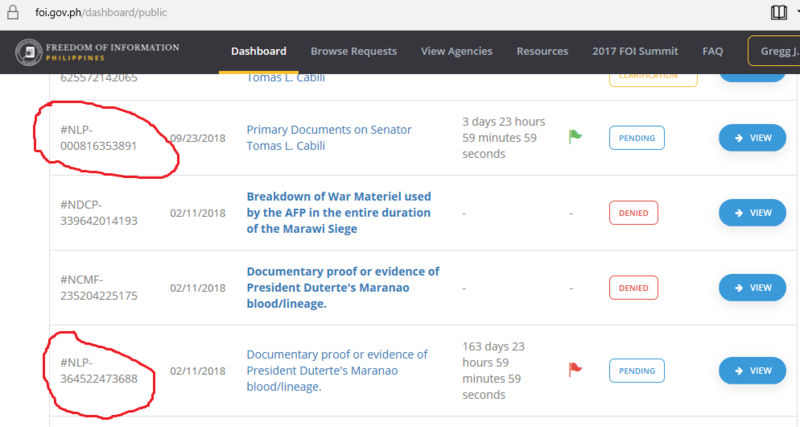 Is the Duterte eFOI a sham? I hope your office can look into this matter. Further, I hope that you will address this request/clarification with utmost immediacy, sincerity, and transparency. Thank you for your request dated Sep 29, 2018 05:31:27 PM under Executive Order No. 2 (s. 2016) on Freedom of Information in the Executive Branch, for Inquiry on the Pending eFOI Requests. We received your request on Sep 29, 2018 05:31:27 PM and will respond on or before Oct 19, 2018 05:31:27 PM, in accordance with the Executive Order's implementing rules and regulations. 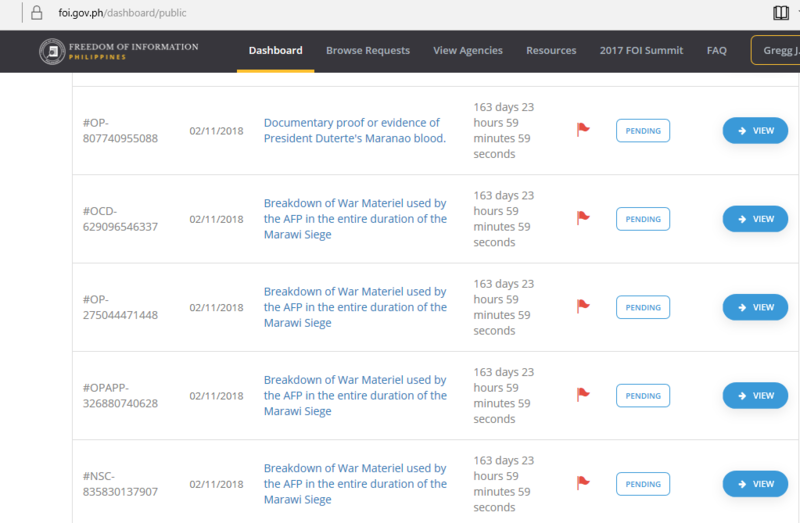 Should you have any questions regarding your request, kindly contact me using the reply function on the eFOI portal at https://www.foi.gov.ph/requests/aglzfmVmb2ktcGhyHgsSB0NvbnRlbnQiEVBDT08tMjM2OTEyNzU3MzQ0DA, for request with ticket number #PCOO-236912757344. I refer to my letter of Sep 29, 2018 05:31:27 PM; about your request under Executive Order No. 2 (s. 2016) on Freedom of Information in the Executive Branch, for Inquiry on the Pending eFOI Requests. Our response to your request is due on Oct 19, 2018 05:31:27 PM. Unfortunately, it is taking longer than expected to deal with your request. I apologize for this delay but have applied for an extension so we could work further on your request. We hope to be able to send you a response on or before Nov 16, 2018 05:31:27 PM. Thank you for your concern regarding this matter. Please do take your time. Thank you for your request dated Sep 29, 2018 05:31:27 PM under Executive Order No. 2 (s. 2016) on Freedom of Information in the Executive Branch. You asked for Inquiry on the Pending eFOI Requests.